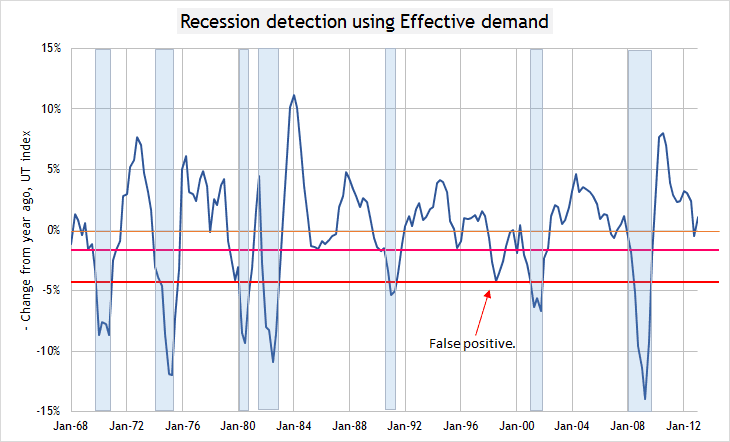 I worked with Dwaine Van Vuuren of Recession Alert a few months ago on using the effective demand limit to detect recessions. He said the effective demand limit gave the best detection of a recession he had ever seen. He said he had seen hundreds. I want to show you one graph he came up with. 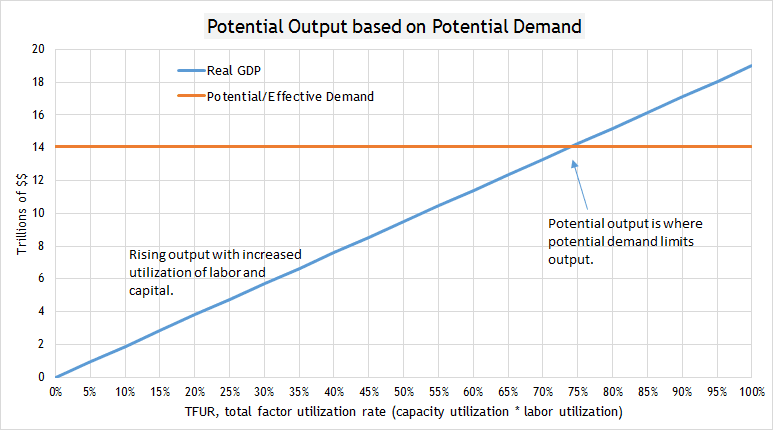 This graph is a measure of the gap between real GDP and the effective demand limit. I already showed how this limit will signal a recession in a prior post. This graph from Dwain goes deeper. The pink line marks the threshold at 1.6%. In every single case, when the plot broke below the pink line, a recession was currently happening or imminent. The bottom red line was added because of the false positive in 1997. My view is that there was distorted data for 1997. Apparently from Dwaine, this is a very reliable method to detect a recession. He has since used the effective demand limit to make even better methods to detect a recession, but I will leave it to him to share and publish that work. A recession is signaled after the gap has narrowed to 0% and then starts widening again. 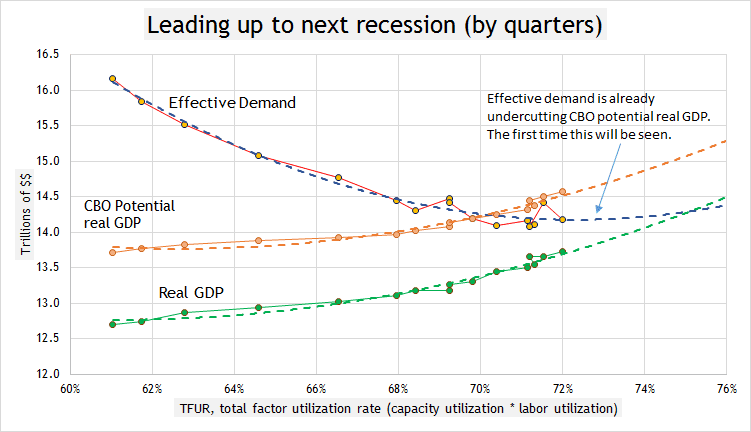 Once the y-o-y “rate” of widening surpasses the threshold, 1.6% in graph, a recession is tumbling in. As of the 1st quarter 2013, we were not in a recession. Menzie Chinn over at Econbrowser posted on low inflation today. His argument is that there is still lots of slack from real GDP being way below potential real GDP and from high unemployment. The idea is that abundant slack depresses prices. Inflation is generated as slack capacity is utilized. It’s the normal result of labor market forces in an expanding business cycle. Increased money from business expansion progressively chases fewer goods through marginally declining production. Normally, slack production is balanced by weak liquidity in the hands of consumers. But there is a deeper problem here than Menzie points to. He is pointing to a present situation of slack capacity, but the problem of slack capacity is so much broader and deeper, because liquidity in the hands of consumers is at a much lower level permanently now. So even if you have spare capacity and slack in the economy, inflation would still trend low. People need money. That is the purpose of the Fed’s loose monetary policy. But there is no transmission mechanism that gets money into the hands of people. Money is predominantly created in the economy through loans and credit from banks. Banks have to make loans or extend credit in order for people to have more money, more liquidity, in their hands. Banks simply have not been making enough loans to sectors of the economy where the money will end up in people’s hands. People could have more money if their wages were increased in real terms. However, real wages are not increasing. Increasing wages is much better than extended credit for consumption demand, because extended credit is an injection into the circular flow of the economy that must be offset by a leakage. In other words, leveraged consumption will eventually be balanced by de-leveraging. Wages are not a debt, but rather a debt paid to labor for having done work. Labor is then free to consume without compromising future wages. On the other hand, extended credit for consumption eventually leads to a leakage from the circular flow because it is a debt that compromises future consumption by labor. There are efforts to put money in the hands of people by creating local currencies and mutual credit groups. You can watch two video documentaries about this subject. 1) The Money Fix … 2) 97% owned (from Britain). These two videos contain profound truths about money. And there is also the Basic Income movement. The idea of a basic income or insured living wage goes back to Beatrice Webb who helped found the London School of Economics. The obvious purpose of a Basic Income is to put money in the hands of people so they can survive, eat, clothe themselves and find shelter. The broader purpose of a basic income is to insure a liquidity foundation in the economy. With a stronger insured foundation for liquidity of people in general, the demand constraints in the economy that I and others write about would not be such a problem. It is pretty clear that banks can be too big too fail and require liquidity to keep the economy alive. But is it understood that people as a group are too big to fail too? People require liquidity too. The economy is dying because people require more liquidity. I support efforts to increase money in the hands of people that do not depend upon creating debt. * The author is a financial manager and university professor. Living in Santo Domingo. In recent years the Dominican people have lost their courage and spirit of defense to the extent that the authorities will increase costs, expenses and prices, and they do not flinch or react to protect themselves from measures that are adverse to their limited or low family budget. The people act as if anesthetized or masochistic. It is surprising to see that every week fuel prices increase steadily. All goods and services in one way or another are impacted by these increases and the Dominican people whether healthy or hard-worker don’t raise their voice in protest. The reason may have to do with the opposition that today is divided in some cases and in others silenced by corrupting money. While inflation is reported from January to May 2013 at 1.72% and the annualized (May 2012 to May 2013) 4.99%, the people see in the markets that this is not so as the prices of a basket of necessary household items is estimated at more than RD $ 25,000.00. The situation is made worse because in many households with more than four members one person barely works with a net income of only RD $ 7,000.00. No surprise to anyone to see how people entering the malls and supermarkets come out with one little pillow or perhaps empty handed, except for employees of public and private administrations who come out with lofty and luxurious emoluments and associated accessories. So far this year, there are no signs of improvement in the pronounced inactivity of the economy that is on the verge of falling into recession, despite the injection of RD $ 20,000 million easing of reserve requirements and RD $ 9,000 million of assumed budget savings. Nothing has been able to push the car of the Dominican economy and all because of the abysmal fiscal deficit over RD $ 205,000 million. All the while Mr. Leonel Fernández, the intellectual and material author of such deficit, has not been invited to go through the Dominican courts when for less foul or violations of the laws of the United States and Mainland China, a common citizen or a senior official would be processed to even the extreme of the death penalty. For this, there are many Dominican families who are now deprived of a crust of bread and a mabí (sugar water, popularly known as tennis water) if not a glass of milk to sustain their lives. Whole families with sorrow, eat something only once a day, others have to go to bed with a grain of salt under the tongue and a glass of water, in some cases non-potable water, living below the poverty line. This includes families who will never even reach the point of balance (equality between income and expenditure before taxes and interest, that is if they have a loan). While all this happens, employees and high officials and the people related to the Executive party of the government enjoy high incomes and cushy benefits that allow them to eat and drink like kings and enjoy good resorts and travel abroad. Poverty increases as an expense of correcting irregularities among other public finances over the past years. What a shame that it is the dispossessed people who are paying the costs of a party to which they were not invited and the party has not ended yet. Neither was it felt in the shops or on public roads on mothers day or fathers day and many other traditional celebrations, as the purchasing power is at a minimum. So people only spend money when they find a bit on a piece banana only to live poorly. The Defender of the people is not present, as this problem has no office or budget in the government, but neither is the Pro-consumer present as seen previously. It is forbidden to punish violators of the laws who sell expired products at inflated prices. Definitely the people are defenseless, and perhaps, due to a poor diet, the people have no strength to raise their voice in protest, so that if the living forces, now dead, are not resuscitated as recently seen in Brazil by corruption and the high cost of living, soon the Dominican people will be a nation of the dead, ghosts or zombies. 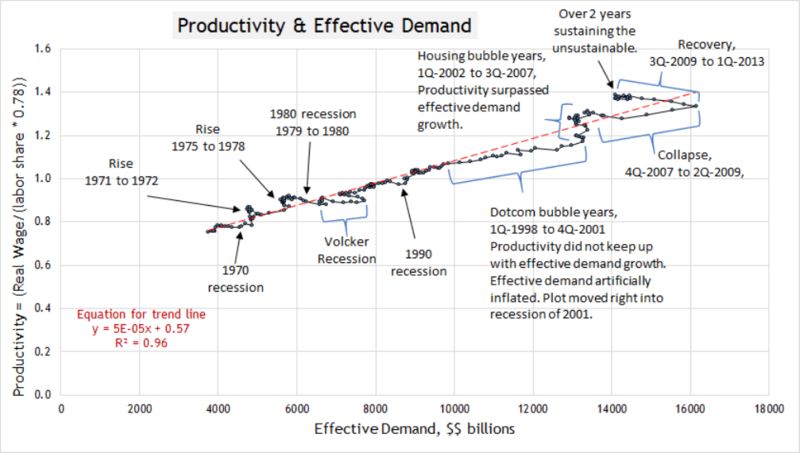 Productivity & Effective Demand: An Intriguing and Disturbing Story . . .
Edward Lambert at Effective Demand; Effective Demand = Effective Labor Income/(cu*(1-u)) points to the result of an economy left to maximize Profits at the expense of Labor. I have my own version or underlying causes of this issue and Edward gives the economic side of it. I am going to show a graph of Productivity against Effective demand. It is an intriguing and a disturbing graph. Let me start by giving the equation for the productivity used in the graph. The data for this equation comes from this graph at FRED. Let me just show the graph and then start explaining . . . The graph shows quarterly data from 1967 to the 1st quarter of 2013. The red dashed line is a trend line for the data. We can see that from 1967 to 1997, the plot stayed very tight on the trend line. There were deviations from this line during times of shocks and recessions. But it is very interesting how closely the plot followed the trend line before 1997. Before 1997, the plot going below the trend line was associated with a recession. The explanation of this is that effective demand rises more during a recession because of more available capacity of labor and capital. At the same time. productivity tends to fall behind the trend line due to rising labor share, not falling real compensation. 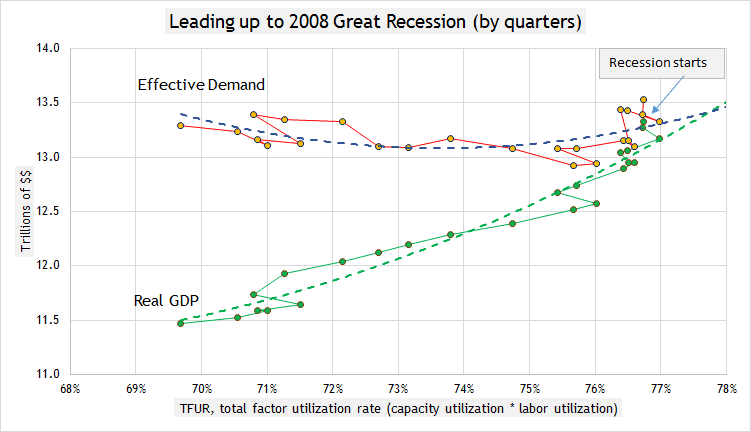 When the plot goes above the trend line, productivity is ahead of effective demand. Productivity rises due to labor share settling down and real compensation rising. Effective demand tends to stay still during the expansionary phase of a business cycle. 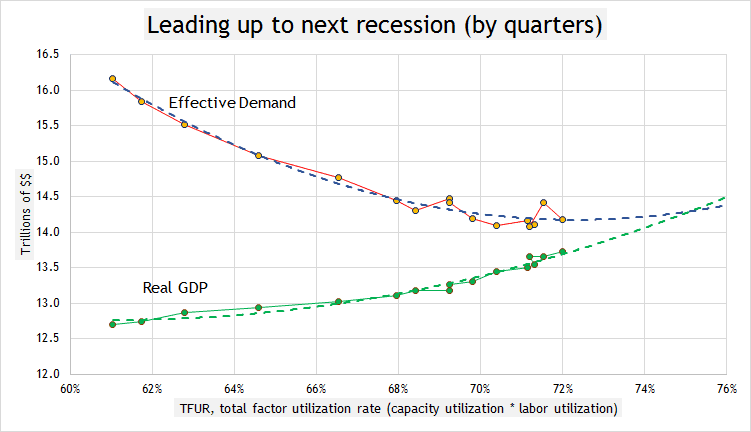 The economy grows up to the effective demand limit and then gets set for a contraction. We used to have a balance between productivity and effective demand. The economy moved directly on top of the trend line for many many quarters. And now the economy has lost that balance. 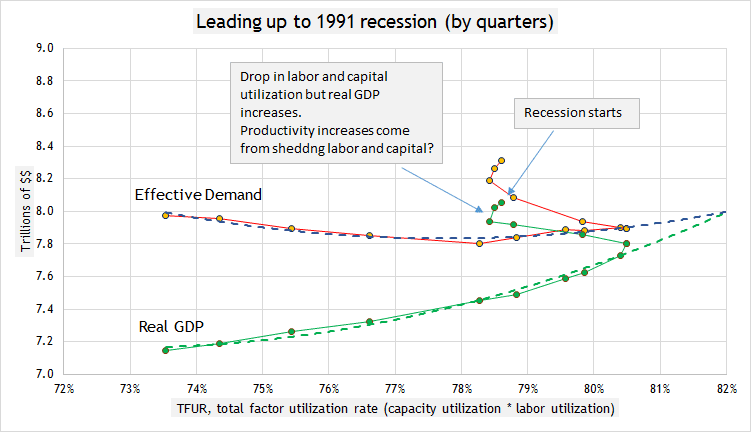 Since the late 90’s it is a fleeting moment when productivity and effective demand come together on the trend line. Before 1997, there was very little movement away from the trend line. Then something unusual happened between 1997 and 2001, the dotcom bubble years. The plot went progressively below the trend line even though there was no recession. Productivity was rising during these years, but effective demand was rising at such an unusual rate that productivity could not keep up with it. Effective demand was being artificially created and inflated. The recession of 2001 followed the same unusual path as before the recession. In 2002, the economy had to make an adjustment. 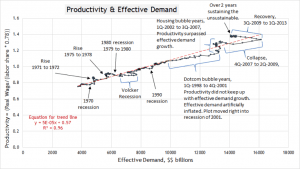 Productivity had to rise or effective demand had to fall. During the housing bubble years (from 2002 to the quarter right before the 2008 recession), productivity rose, while effective demand basically stayed steady. 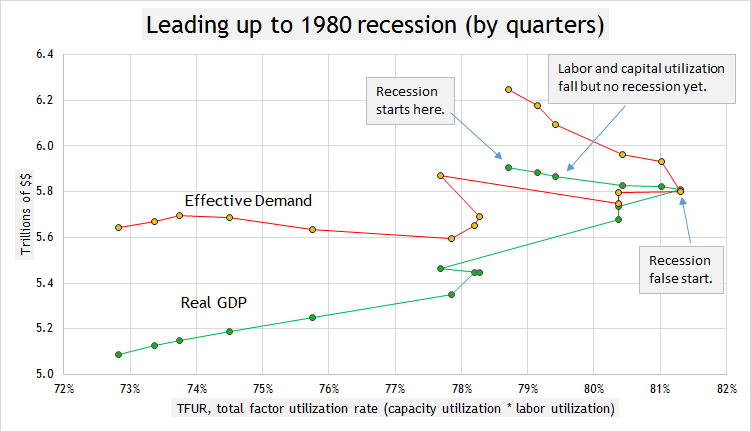 The plot went back above the trend line showing that productivity was beyond the capacity of effective demand and that productivity was at a non-sustainable level. The economy sustained this high level of productivity in the face of low effective demand for a few years, but eventually the correction would come in 2008. The correction was a collapse. Look at where the economy is now. Since the end of 2010, the plot has barely moved from a productivity just below 1.4 and an effective demand around $14.1 trillion. The plot is way above the trend line and has been just sitting in the same spot for over 2 years. 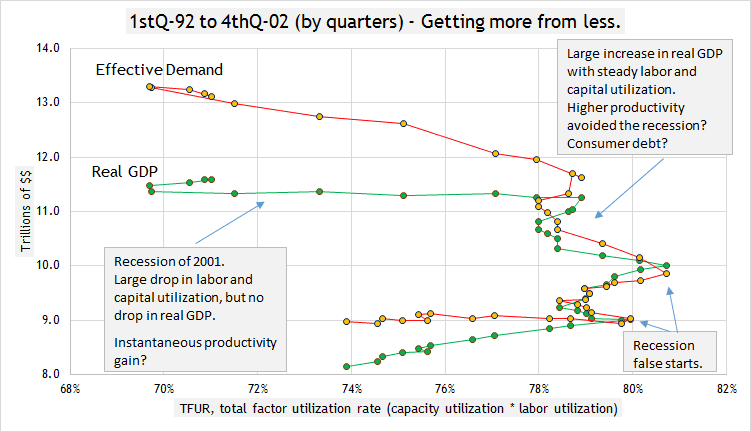 Effective demand is too low for the current productivity in the US. This is an economic bomb building energy that will eventually go off when real GDP approaches $14.1 trillion. A friend of mine had a dream a few nights ago, where a spirit said that the economy is dying. The graph above would lead one to think the same. Think about it… where can the economy go now from here? There are 2 options . . .
Option #1 looks at the equation for Productivity: You have to lower productivity by increasing labor share in relation to real compensation. 1. If you lower real compensation, labor share would fall, but it would have to fall slower than real compensation. 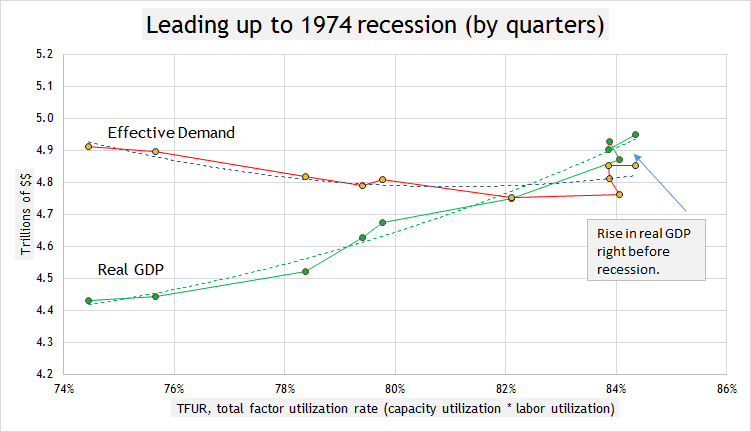 Keep in mind though that a lower labor share would lower effective demand too, which would work against the objective. However, if labor share actually rose in the face of lowering real compensation, you would see an economic contraction. So lowering real compensation is not a good option. 2. On the other hand, if you raised labor share faster than raising real compensation, productivity would come down as effective demand increased from higher labor share. This is a safe and sensible way to correct the huge imbalance we find ourselves in. Option #2 looks at the equation for Effective Demand: You have to increase effective demand back up to $16 trillion. There are two options here as well. 1. Utilization of labor and capital would have fall. (TFUR in the equation above would have to fall.) This would mean a rise in unemployment, which would mean another collapse. 2. Labor share would have to rise. This would also have the beneficial effect of lowering productivity, as long as real compensation rose moderately. As we can see, the only real option to avert another collapse is to raise labor share of income. This is not likely as businesses are even now fighting an increase in just the minimum wage. Businesses are trying to maximize their profits and do not want to raise labor costs. Yet this objective of theirs is going to kill the economy. The graph above shows that there is a bomb ticking, and it is a bigger bomb than we saw in 2008. Higher productivity in the face of low effective demand is unsustainable. Yet, we have been sustaining it for over 2 years now with an incredible expansionary monetary policy in the face of an incredibly low labor share of income.